There's something about a fat, crunchy pickle that just screams SUMMER to me! 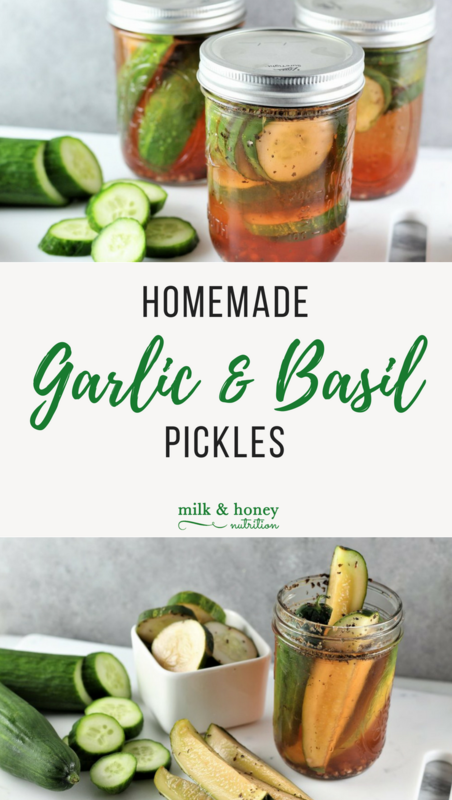 These Homemade Garlic and Basil Pickles are loaded with crunch and flavor, without all the preservatives and food coloring found in store bought pickles. Feel free to play around with the flavorings and you can multiply this recipe as many times as you like. All of the ingredients listed will fit in a wide mouth 12oz. mason jar. Make as many jars as you'd like. Chop the cucumber into desried shapes (leave whole, halves, spears, or round slices). Place into your mason jar. Add the salt, garlic, basil, and vinegars. Then fill the jar just to the top with water. Secure lid and shake to mix ingredients. Store in the refrigerator for at least 12 hours before eating. Enjoy!